(1) MEDIATION DYNAMICS trains people to become qualified mediators. MEDIATION DYNAMICS mediation training meets or exceeds the standards set by Texas law and the Texas Mediation Trainers Roundtable. 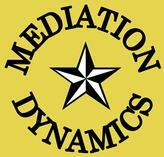 (2) MEDIATION DYNAMICS provides customized training for businesses and universities. Our training areas include management and leadership, conflict resolution, communication skills, and of course, mediation. (3) MEDIATION DYNAMICS provides mediation services for: attorneys and their clients, workplace conflict resolution, or individual dispute resolution. Don R. Kelly, Ph.D., L.M.S.W. MEDIATION DYNAMICS training is practical, in-person training which focuses on what mediators actually do. MEDIATION DYNAMICS training teaches practical techniques for helping emotional people to collaborate and resolve their own disputes. Mediation Dynamics training qualifies participants to be court-appointed mediators and teaches skills that help participants communicate and work with people every day. Since MEDIATION DYNAMICS started in the year 2000, many people from many diverse fields have taken MEDIATION DYNAMICS training including: attorneys, ministers, accountants, sales associates, military officers, realtors, insurance agents, executives, managers, secretaries, doctors, counselors, social workers, ranchers, financial advisors, engineers, mechanics, and many more. We even had a repo-man once and, another time, a repo-woman. MEDIATION DYNAMICS courses meet or exceed the standards specified by Texas law in the Texas Civil Practice and Remedies Code, section 154.052. MEDIATION DYNAMICS courses are designed to satisfy the standards of the Texas Mediation Trainers Roundtable and also the Texas Mediator Credentialing Association. MEDIATION DYNAMICS courses have been approved for Minimum Continuing Legal Education credit by the State Bar of Texas Committee on MCLE. MEDIATION DYNAMICS has been approved as a continuing education provider for licensed social workers by the Texas State Board of Social Work Examiners. Please note that there is no “certified mediator” designation in Texas - no Texas state agency certifies or licenses mediators. ​An applicant who misses an entire MEDIATION DYNAMICS course for any reason will receive a full refund of any advance payment collected for that course from that applicant. ​In addition to cash, check, or money order, MEDIATION DYNAMICS accepts credit cards (using PayPal) or "PayPal CREDIT" financing. Please see the Registration and Payment page for more details. ​For more information about financing, visit www.PayPalCredit.com. Subject to credit approval. If approved, use our PayPal "Cart" buttons and choose "PayPal Check out" to access the "PayPal CREDIT" payment source option. Please call Mark W. Batchelder at 817-926-5555 with any questions about MEDIATION DYNAMICS.